Okay, so last weekend I went to the Theakstons Old Peculier Crime Writing Festival in Harrogate. 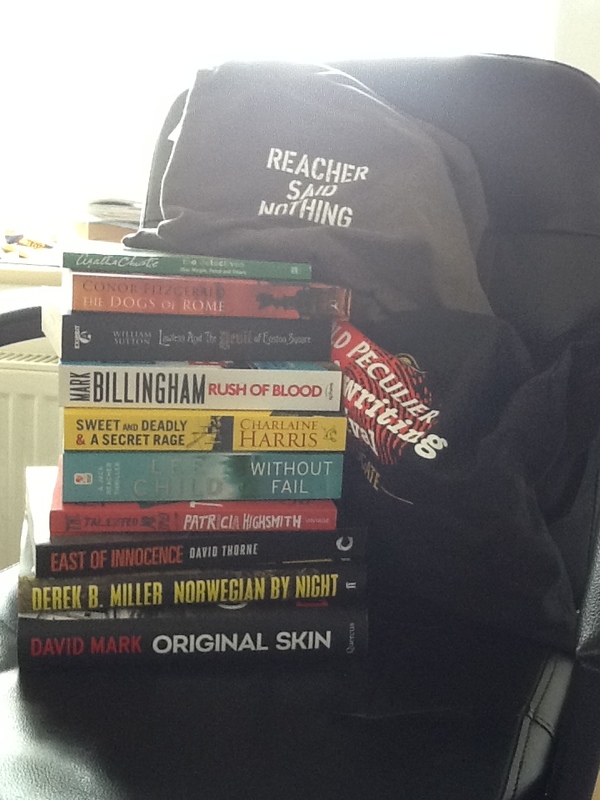 It was a fabulous event, and I’ll be telling you more in my blog post tomorrow, but for today I thought I’d post a photo of all the fabulous goodies I got at the event – a whole bunch of brilliant books (many of which I managed to have signed), an awesome festival goodie bag, and an amazing ‘Reacher said Nothing’ t-shirt. I love coming away from the event with loads of books. I’m reading Sarah Hilary’s at the minute and loving it! I love the swag as well, you got some good ones there to. I was given a copy of Paul Mark Tag’s White Thaw: The Helheim Conspiracy. Not as much crime as conspiracy as the book name says but it has been brilliant, a definite recommendation! paulmarktag.com for it’s info!